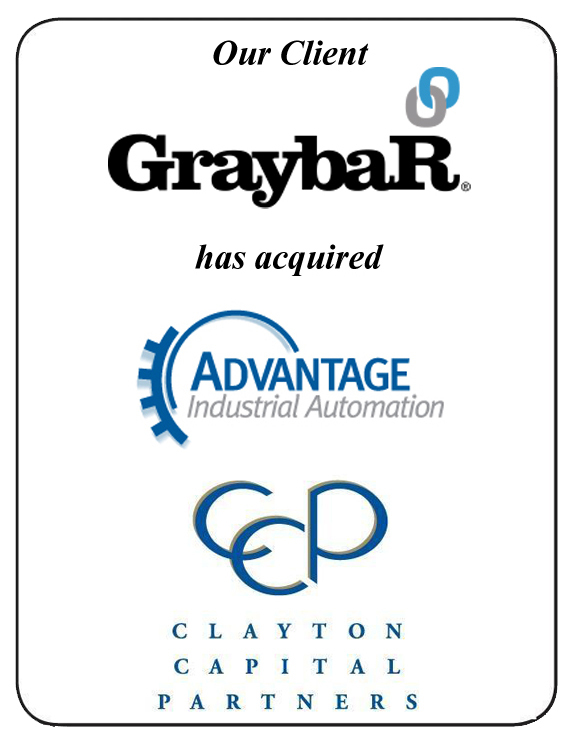 Clayton Capital Partners is pleased to announce that its client, Graybar Electric Company, Inc. has acquired Advantage Industrial Automation. Graybar Electric Company, Inc. (www.graybar.com) based in St. Louis, MO, is a Fortune 500 company, specializing in supply chain management services and is a leading North American distributor of high-quality components, equipment and materials for a number of industries. Advantage Industrial Automation (www.advantageind.com) based in Duluth, GA, is a provider of automation solutions to industrial users, OEMs and system integrators that help to increase productivity and quality, reduce downtime, save energy or provide a safer work place.